Ursula Heise says we should think of our cities as “urban arks” that could provide refuge for endangered species from around the world. Ursula Heise is the Marcia H. Howard professor of literary studies at UCLA and a member of the UCLA Institute of the Environment and Sustainability. This column appeared in Citylab. Her name was Lola. No, not “L-O-L-A, Lola,” from the Kinks’ song, but a Mexican Redhead. Well, actually, not that either, it turned out. That was my introduction to a bird species, one of whom I adopted 10 years ago from a friend of a friend, as these things go among people who live with pet birds. But it was only after I moved to Los Angeles that I found out about her feral cousins, the large wild flocks of red-crowned parrots that live in the San Gabriel Valley, just northeast of Los Angeles. Parrots, of course, are not uncommon around Los Angeles: More than a dozen different species have established wild populations in the area, descendants of pet birds that escaped at some point and managed to make a home for themselves in some part of the sprawling metropolis. But for the red-crowned parrots, Los Angeles is more than an additional habitat. The city is a sanctuary for this endangered species. 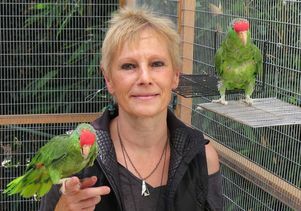 In the 1970s and 80s, tens of thousands of chicks and adults were poached from the red-crowned parrots’ original habitat in northeastern Mexico, in the states of Tamaulipas and San Luis Potosí, and brought to the United States to be sold in the pet trade. 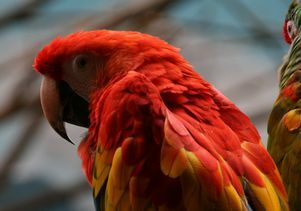 Because of the poaching and habitat loss from deforestation, their population dwindled in Mexico, and red-crowned parrots are now listed as an endangered species in Mexico and by the International Union for the Conservation of Nature. But the implications of these parrots’ presence in the city goes beyond emotion and aesthetics. It makes me wonder, could Los Angeles become a sanctuary for other endangered species — even those who are not native to Southern California? Some ecologists think so. Brad Shaffer, a biology professor at the University of California, Los Angeles, notes that cities not only destroy habitat, but also create new living spaces for animals and plants. Some of these spaces work well for native species, while others don’t. Some of these modified landscapes could offer refuge to species that are struggling to survive in their original habitats elsewhere. In the past, some of the new ecological niches that have been created in cities have been occupied by non-native species through sheer serendipity, by plants or animals like the red-crowned parrots that happened to land in town and know how to take advantage of the niches they found. But what if we deliberately offered sanctuary to endangered species in our cities — those that are native, of course, but also those that are not? Parrot. Javier Vidal/Flickr. Creative Commons 2.0.